This meal is so simple, even my dad can cook it pretty well. 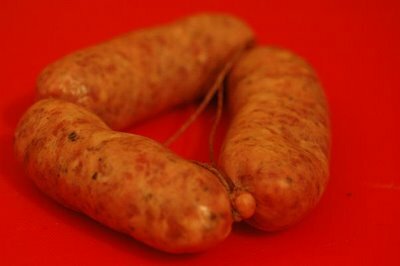 It's a simple recipe that uses beautiful peppered gluten-free, preservative-free sausages that we buy from our favourite Italian deli Gallo Nero in Stoke Newington. They are flown in from Tuscany and delivered to owner Michael every few days. They are simply wonderful, but with no preservative they don't keep at all well - so imagine how much better they would be eaten fresh in Firenze. Like so many great meals, start with chopped onions and chopped crushed garlic. For this recipe for 2-3 people, use 1 very large onion and 2-3 cloves of garlic. Slice and add 2 large or 3 medium leeks. Heat some vegetable oil in a frying pan, put the leek and onion mix into the hot oil and add a little salt and plenty of black pepper. Sweat off the leek and onion mix. Don't be afraid to add more black pepper. This is going to be a dish that bites back! Now for the sausages. The black bits you can see in the picture below are pieces of crushed black pepper. By the time these sausages have disembarked from the plane and passed through customs, they are costing about 80p (about $1.50 at current echange rates). It may be tempting to swap for something cheaper, but this will destroy the meal. Accept no substitutes! Unlike cheap sausages, these pure meat beasts take quite a long time to cook properly. 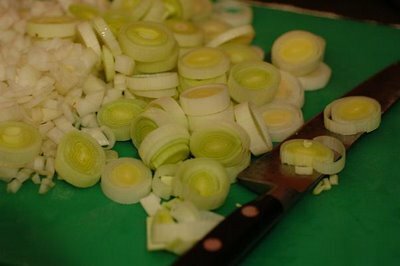 The trick with the leek and onion is to remove almost all of it at this stage and re-introduce it during the cooking, in several stages. 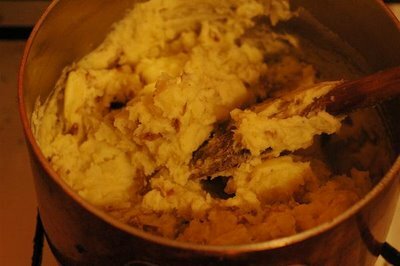 This is the same trick that can give Lyonnaise potato that wonderful graduated texture, with some firm, some soft and some almost disintegrated. Put the sausages into the pan and sear them, ready for the braising stage of the cooking. The sausages need to cook slowly for about 1 hour. Either braise on the gas with a glass lid on the pan, or put into a casserole dish and cook in the oven on gas mark 3½ (170˚C). 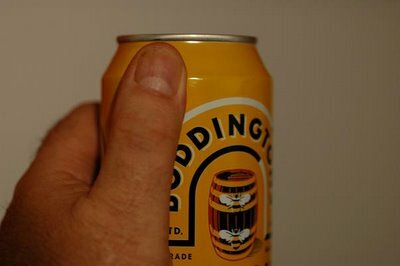 It is best to cook them in red wine, or as I did the other night, in beer. Add enough to braise the sausages and top up 4 or 5 times during the cooking process. Here you see the sausages beginning to take on colour. 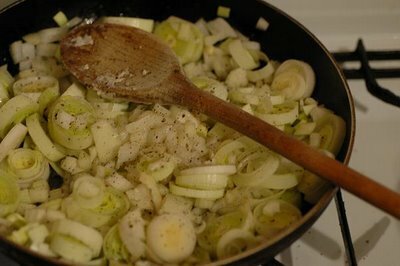 Some leek and onion is already well cooked and some more of it has just been added. This is a good time to add some herbs to the dish. I used French herbes de Provence, but any herb mix you like would be good. Marjoram, bay leaf and fennel are the traditional herbs for sausage. 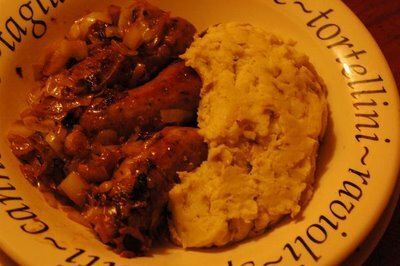 These sausages go best with a very dry mashed potato. 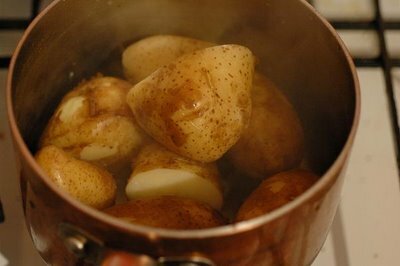 Boil some young potatoes in their scrubbed skins and remove from the heat while still very firm. Drain off and dry over the flame to get rid of any remaining excess water. Then add a knob of butter, two tablespoons of double cream, salt and pepper and stir vigorously with a wooden spoon until the creamed potato is thoroughly blended. Very different from pomme purée, this dish is rustic, robust and well-textured. 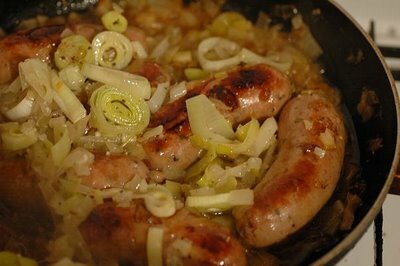 This allows it to stand up for itself and not be drowned by the sausage and leek & onion. 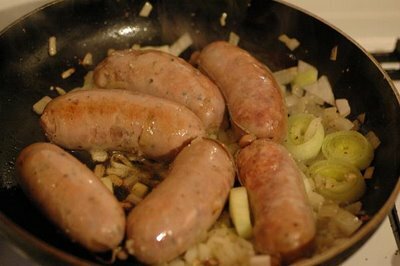 Drain any excess oil from the sausage, leek & onions. Serve with the mashed potato on pre-heated plates or in large hot bowls. Find a friend, sit down and enjoy a great, filling, spicy winter meal.